For lovers of nature, flowery gardens and German culture, we suggest to get to know the Romantic Route. Flanked by plane trees that in the fall offer a special atmosphere, breathtaking landscape and full of half-timbered buildings (typical German architecture), the Romantic Route has many leisure options for weekend getaways or for those who wish a quiet, romantic stay. For those who enjoy the coziness that the cold weather offers, the months of May through August are perfect to get to know our comfortable and charming hotels and guesthouses, besides a plentiful and varied gastronomic network. It is in these months that the typical fog and frost are most frequent, phenomena that provide beautiful records. But when springtime arrives accompanied by milder temperatures and longer days, the color of the innumerous places, streets and house gardens are a sight for sore eyes. It is at this time of the year that nature sports such as walking and hiking are offered by practically all member towns of the route. The Romantic Route has been often named in the list of the top 10 most beautiful and charming roads to travel by car in Brazil. This title was conquered mainly due to the zeal that all the towns have for their well-tendered roads, most of them flanked by plane trees. Located between the plain of the Rio dos Sinos valley and the Highlands of the Serra Gaúcha, the Romantic Route is only 40 km from the capital Porto Alegre and 35 km from the city of Caxias do Sul, two important access routes to Rio Grande do Sul. With your own car or a rented one, let yourself be charmed by this itinerary which brings a new emotion at every turn. Gostaria de consultar todos os eventos do mês? Acesse a Agenda de Eventos. Founded in 1824, the city is the cradle of German colonization in Brazil, and for this reason it is the ground zero of the Romantic Route. 34 km away from the capital of the State, the city has a diversified, globalized industrial base apart from significant commercial and services sectors. It has several venues for events, tourist attractions, a growing hotel chain, and one of the liveliest night lives in the metropolitan area. São Leopoldo also hosts two excellence private universities, EST and UNISINOS, being the latter regarded as one of the best in the country according to the Education and Culture Ministry (MEC). *Images of the Municipal Secretaries of Tourism of the cities that compose the itinerary. Located 42 km from the capital of the State, the city was born and developed with the shoe industry, the reason why it is called the National Shoe Capital. With the largest exhibition and trade fair venue in the region, it hosts various national and international events every year. Characterized by the high shoe production, Novo Hamburgo also stands out due to its tourist attractions. Traces of German colonization, historic buildings, shoe shopping at affordable prices, a beautiful countryside and, also, religious buildings attract visitors to the city. Estância Velha is an important leather supplier for the industry of Rio Grande do Sul, and is recognized by its events, which portray the German culture, such as “kerb” balls, traditional festivals with lots of draft beer, dance and cheerfulness. Bringing back culture, history, and highlighting the contemporaneity of traditions make of Estância Velha an eclectic small city. With a strong presence of German culture, Ivoti strengthens its historic heritage as having the largest village with half-timbered houses in Brazil. It also has one of the largest groups of Japanese people living in Rio Grande do Sul. The title “Flower Town” is not a mere slogan. The flowers, their colors and perfume are everywhere: in its streets and avenues, places and in the essence of its inhabitants. Besides embellishing the town, the flowers play a fundamental role in the touristic development of Ivoti, apart from the vast calendar of events along the year. The German origin of most of its population can be seen in the faces of its inhabitants and in their German dialect or the Portuguese spoken with a strong accent. In its cultural traditions is also the enjoyment of dancing, singing, music and festivals. And, mainly, in the importance given to education. Church, school and work were in the past and still are in the present the three pillars on which the history of Dois Irmãos is built. The town also stands out for the economic development of the Brazilian shoe industry having several industries of this sector. Morro Reuter with its small town features often makes people go back in time. Ox carts loaded with hay, milk cans by the road are still common. Along its streets and places, lavender, the flower symbol of the municipality, and plane trees, both symbols of romanticism and inspiration, make the landscape exuberant and even more obvious the veins of colonization. This municipality has a beautiful topography, combining hills and valleys, which favors ecologic and rural tourism. Around 50% of the population still lives in the countryside, and 90% still communicates in the Hunsrück dialect. The cultural heritage can be seen in the half-timbered buildings and gastronomy, which still preserves typical products and the way of manufacturing them. Known as the Capital of countryside “schmier”, the history of the municipality began around 1750, when the first drivers took cattle to São Paulo. In turn, the first German immigrants, coming from the Hunsrück region, began to settle down in Linha Nova Baixa around 1830. From its history, farming is the oldest economic activity in the municipality. Cradle of brewery in Rio Grande do Sul, Linha Nova had the first brewery, and in the basement of family Ritter, whose old house is located beside the Municipal Park, and is regarded as a tourist attraction in town. 70% of the economy of the municipality still comes from the primary sector, which is ideal for those who search for contact with nature, adventure tourism and tranquility. Known as the Town of Lilies, Picada Café is located on the Encosta da Serra Gaúcha. Nature, with its numerous valleys, mountains, brooks and rivers, embraces the municipality and favors ecotourism. Originated from German immigration, half-timbered houses with flower and vegetable gardens, small cattle pastures, and the tranquility of country life are characteristics of a simple, hard-working and happy people. Nova Petrópolis holds the title of Garden of the Serra Gaúcha because it is one of the most flowery towns in the region, apart from having exuberant natural tourist attractions. It is also the National Capital of Cooperativism for hosting the first credit union in Latin America. The German culture seen in the architecture, the accent, and the natural festive atmosphere among the people of German descendancy are typical of a town that does its best to keep alive the Brazilian Germany in this small municipality. One of the most popular destinations in Brazil, Gramado is charming with its flowery streets, architecture details, hospitality, and the assorted gastronomy. With events all over the years and the largest touristic infrastructure in the State, Gramado offers over 200 gastronomic places and around 10,000 hotel beds in the most varied means of hosting. The small city is also worldwide known for the Natal Luz and the International Film Festival, and it attracts millions of people all over the year. Blessed by nature with a geography that turns it into a center of ecotourism and adventure tourism, Canela has a varied flora and fauna, and offers tranquility and many leisure and relax options. Gastronomy also encompasses various cultures, with service excellence as well as very cozy and comfortable hotels and guest houses. With a strong touristic vocation, it hosts cultural and entertainment events all the year. Located in the Campos de Cima da Serra, São Francisco de Paula was initially inhabited by Indians and cattle drivers who travelled between Rio Grande do Sul and São Paulo. The largest municipality in extension in the Romantic Route, it is known for its natural wonders and the cultivation of “pinhão”, the araucaria pine nut. It has in its hotel and gastronomy chain the coziness of Southern Brazilian highlands people. 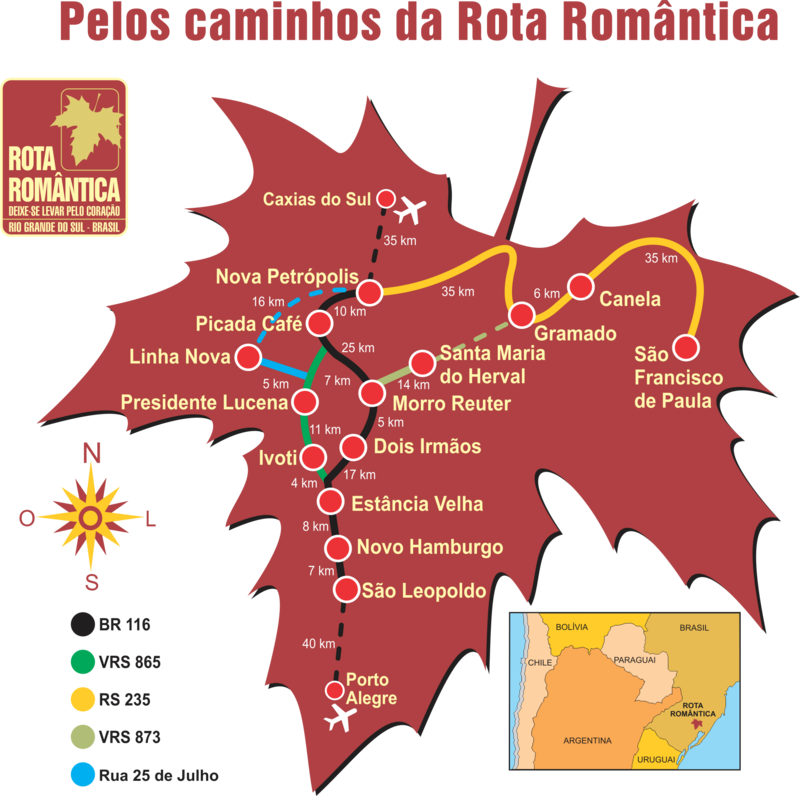 The “Romantic Route Project” began at the end of 1994 and the beginning of 1995 when the first meetings took place among representatives of a few municipalities that in the future would be part of the project. Inspired and conceived by a homonymous route in Germany, the Romantic Route in the State of Rio Grande do Sul, Brazil, began with the idea, in the gaucho version, of a touristic route with small cities and towns of predominantly German immigration. São Leopoldo, Novo Hamburgo, Estância Velha, Ivoti, Dois Irmãos, Morro Reuter, Santa Maria do Herval, Presidente Lucena, Picada Café, Nova Petrópolis, Gramado, Canela, and São Francisco de Paula were the chosen ones to be part of the Project. The first ones because their population is strongly attached to German immigration and the two last ones because of their touristic tradition. During the first semester of 1995 several meetings with the representatives of the municipalities, tourism organizations and public and private entities were held to consolidate and improve the project idea. In June 26, 1995 the project of the touristic route was launched for tourism organizations, the community in general, and public and private entities, when a protocol of intentions was signed with the support of the State Secretary of Tourism, Rio Grande do Sul Tourism Chamber, and EMBRATUR, among eleven municipalities and the Pontifical Catholic University of Rio Grande do Sul, through FAMECOS and its Course in Tourism, which was in charge of the touristic mapping and diagnosis of the municipalities. In the beginning of 1996, from March 16 to 29, there was a study trip to observe the Romantische Strasse in Germany, and a delegation traveled with the objective to get to know the means, factors, sectors, and agents producing tourism in that region and collect data to implant the gaucho route. 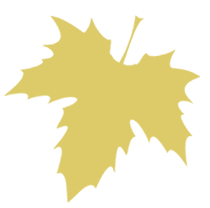 In April 22, 1996 the Association of the Municipalities of the Romantic Route – AMRR was founded with the first General Meeting of the municipalities that were part of the then “Romantic Route Project, and later the first statute and entry as a legal entity of the Association in the competent bodies was registered at a Notary’s office”. From then on the Association of the Municipalities of the Romantic Route began to exist in fact and in law. The year 2008 was also notable because at the General Meeting that took place on October 30 that year the new text of the statute was approved, a necessary change specifically to adapt the provisions of the Law 9.790 from March 23, 1999, which establishes and regulates organizations of the civil society of public interest (OSCIP). From this approval on the denomination “Romantic Route Association - ARR” began to be used. In May 2012 another municipality was officially included, Linha Nova, being now 14 participants. São Leopoldo, Novo Hamburgo, Estância Velha, Ivoti, Dois Irmãos, Morro Reuter, Santa Maria do Herval, Presidente Lucena, Linha Nova, Picada Café, Nova Petrópolis, Gramado, Canela, and São Francisco de Paula are the municipalities that are currently part of the Romantic Route. We work with the 14 participants institutionally with the objective to promote and develop regional tourism collectively. An exciting way with strong cultural values and several attractions to offer. Identified along the route, preservation of the German culture inherited from the immigrants is noticed in traditional festivals, splendorous garden, colonial markets, typical bands, folk groups… Besides the cultural trip, the region also offers contact with exuberant nature. The Romantic Route, with the diversity offered by the 14 municipalities, has the structure to receive demanding visitors who search for refined cuisine and exquisite hotel, but also pleases those who prefer family guesthouses and the delicious colonial food. There are so many options that your trip will certainly be unforgettable. Currently the seat of the Romantic Route is in the Medieval Tower, by the Tourism Office, on 100 Avenida 15 de Novembro, at the city center of Nova Petrópolis, Rio Grande do Sul, Brazil. Localizada entre a planície do Vale do Sinos até o Planalto da Serra Gaúcha, a 40 Km de Porto Alegre, no Rio Grande do Sul, a Rota Romântica é um roteiro irresistível, onde a cultura alemã e o clima europeu são destaques. São Leopoldo, Novo Hamburgo, Estância Velha, Ivoti, Dois Irmãos, Morro Reuter, Santa Maria do Herval, Presidente Lucena, Linha Nova, Picada Café, Nova Petrópolis, Gramado, Canela e São Francisco de Paula são as cidades que compõe a Rota Romântica.